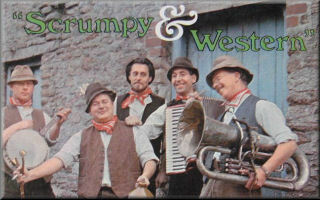 Jethro plus The Wurzels at Cricket St Thomas, Chard, Somerset TA20 4DD (0800 138 26 32) Adults-only weekend break at this premier hotel chain, with Jethro and The Wurzels providing the entertainment. The Mangledwurzels and Fred Bloggs (7.30pm) at a Charity Wassail at Rich's Farmhouse Cider, Mill Farm, Watchfield, Highbridge, Somerset TA9 4RD (01278 783651) All tickets £12.50 including a glass of Mulled Rich's Cider and a large bowl of Winter Warmer Stew. Bar open 'til midnight. Run in association with the Burnham-on-Sea Rotary Club; all profits go to the Somerset Unit for Radio Therapy at Musgrove Park Hospital in Taunton. Tickets from Rich's Cider or the Burnham-on-Sea Rotary Club; ticketline 01278 783651. The Wurzels (9pm) at Holsworthy Memorial Hall, Manor Car Park, North Road, Holsworthy, Devon EX22 6DJ (01409 254185) Tickets £12.50 each; selling fast! Burns Night Supper (7pm for 7.30pm) at Oake Manor Golf Club, Oake, Taunton, Somerset TA4 1BA (01823 461992) Traditional four-course dinner with Tommy Banner from The Wurzels reading the Burns poem. Plus live music and a Scottish piper. Tickets £20.00 in advance. Note: this is NOT a Wurzels gig! The Yetties and Casterbridge Male Voice Choir (7.30pm) at St. Mary's Church, Edward Road, Dorcester, Dorset. The Yetties have done three concerts with this choir so far and they have all been very enjoyable and successful. Tickets available from Harmony Music, The Forum and Tourist Information, Antelope Walk, Dorchester. The Mangledwurzels (7.30pm) at 1st Bristol Spring Cider Festival at the Brunel Passenger Shed, British Empire & Commonwealth Museum, Station Approach, Temple Meads, Bristol BS1 6QH Tickets £6.00 in advance from the Pavilion Box Office shop (tel 01225 330304); £7.00 on the door. Over 80 ciders and perries including award-winning ciders from Ben Crossman's, Rich's, Thatchers, Broadoak and Heck's (Somerset), Weston's and Gwatkin (Herefordshire), Gwynt Y Ddraig (Wales), and Mr. Whiteheads (Hampshire) - as well as hog roast rolls and hot dogs, and a range of soft drinks for the drivers. The Mangledwurzels will be playing a full show at all three sessions. The Mangledwurzels (11.30am) at 1st Bristol Spring Cider Festival at the Brunel Passenger Shed, British Empire & Commonwealth Museum, Station Approach, Temple Meads, Bristol BS1 6QH Tickets £6.00 in advance from the Pavilion Box Office shop (tel 01225 330304); £7.00 on the door. Over 80 ciders and perries including award-winning ciders from Ben Crossman's, Rich's, Thatchers, Broadoak and Heck's (Somerset), Weston's and Gwatkin (Herefordshire), Gwynt Y Ddraig (Wales), and Mr. Whiteheads (Hampshire) - as well as hog roast rolls and hot dogs, and a range of soft drinks for the drivers. The Mangledwurzels will be playing a full show at all three sessions. The Mangledwurzels (noon-late) at UWESU Beer Festival at RED Bar, UWE Students Union, F Block, Frenchay Campus, Bristol BS16 1QY. UWE students and guests only! The Mangledwurzels will be playing a two sets at 6pm & 7.15pm. The Yetties (7.30pm) at The Corn Exchange, Blandford, Dorset. For tickets and more information contact Mrs. J. Driscoll, 35 Philip Rd., Blandford, Dorset, DT11 7NT; tel: 01258 458061. The Yetties at Bradford Peverill Village Hall, Bradford Peverill. For tickets and more information phone 01305 266764.
Who's Afear'd (9pm) at The Old Rooms Inn, Cove Row, Weymouth, Dorset. Part of a day of events commemorating the "Crabchurch Conspiracy" during the English Civil War. Full details on the Weymouth Life website. Midnight Mango presents the Love A Wurzel On The Valentine's Tour with The Wurzels and Peachy Farmer (8pm) at The Lemon Grove at Exeter University, Cornwall House, St Germans Road, Exeter, Devon EX4 6TG (01392 263538) Tickets £10.00 in advance; £12.00 on the door. Midnight Mango presents the Love A Wurzel On The Valentine's Tour with The Wurzels, Fizzy Milk and My Name Is Ian (8pm) at The Palace Theatre, Penel Orlieu, Bridgwater, Somerset TA6 3PF (01278 434507) Tickets £12.00 in advance; £14.00 on the door. Midnight Mango presents the Love A Wurzel On The Valentine's Tour with The Wurzels and Who's Afear'dl (7.30pm) at Cheese & Grain, Market Yard, Frome, Somerset BA11 1BE (0870 380 0017) Tickets £12.00 in advance; £14.00 on the door. The Mangledwurzels (7.30pm) at 3rd Bath Cider Festival at Bath Pavilion, North Parade, Bath BA2 4EU (01225 330304) Tickets £6.00 in advance from the Pavilion Box Office shop; £7.00 on the door. Over 80 ciders and perries including award-winning ciders from Ben Crossman's, Rich's, Thatchers, Broadoak and Heck's (Somerset), Weston's and Gwatkin (Herefordshire), Gwynt Y Ddraig (Wales), and Mr. Whiteheads (Hampshire) - as well as hog roast rolls and hot dogs, and a range of soft drinks for the drivers. The Mangledwurzels will be playing a full show at all four sessions. Midnight Mango presents the Love A Wurzel On The Valentine's Tour with The Wurzels and The Ragged Trousered Philanthropists (8pm) at The Main Hall at University of Plymouth Students' Union, Drake Circus, Plymouth, Devon PL4 8AA (0871 220 0260) Tickets £12.00 in advance; £14.00 on the door. The Yetties at St. Edmunds Church Hall, Weymouth, Dorset. For tickets and more information contact Rod Adams, 21 South Rd., Wyke Regis, Weymouth, Dorset, DT4 9NR. Tel. 01305 785811. The Mangledwurzels (11am) at 3rd Bath Cider Festival at Bath Pavilion, North Parade, Bath BA2 4EU (01225 330304) Tickets £6.00 in advance from the Pavilion Box Office shop; £7.00 on the door. Over 80 ciders and perries including award-winning ciders from Ben Crossman's, Rich's, Thatchers, Broadoak and Heck's (Somerset), Weston's and Gwatkin (Herefordshire), Gwynt Y Ddraig (Wales), and Mr. Whiteheads (Hampshire) - as well as hog roast rolls and hot dogs, and a range of soft drinks for the drivers. The Mangledwurzels will be playing a full show at all four sessions. The Cutlers of Cornwall and Jack Glanville (8pm) at Valentine Bash at Tavistock Wharf, Canal Road, Tavistock, Devon PL19 6AT (01822 611166) Tickets £10.00 in advance; £12.50 on the door. The Wurzels plus guests (8pm) at Gloucester Guildhall, 23 Eastgate Street, Gloucester GL1 1NS (01452 396389) Tickets £12.00 in advance. Over 14s. This is a standing event. The Yetties at Yetties Weekend 2009 at Halsway Manor, Crowcombe, Taunton, Somerset TA4 4BD (01984 618274) The weekend tickets have gone but there is a concert on the Saturday evening which is open to all. Space is limited so if you are interested ring the manor on 01984 618274. Acker Bilk & The New Paramount Jazz Band (8pm) at The Old Market, 11a Upper Market Street, Hove, Brighton, East Sussex BN3 1AS Tickets £24.00. The Yetties (7.30pm) at Musical Heritage of Thomas Hardy Concert in Charlton Horethorne Village Hall, Charlton Horethorne. For tickets and more information contact Jenny & Phil Biggs, Tanglewood, Charlton Horethorne, Sherborne, Dorset, DT9 4NL. The Wurzels (7pm) at Forest Hills Golf Club, Mile End Road, Coleford, Gloucestershire GL16 7BY (01594 810620) Tickets £25.00 per person including hot roast baps and chips (served at 8pm). The Yetties at Bishopstone Village Hall, Bishopstone, Salisbury, Wiltshire. For tickets and more information contact Mr. Ross Colwill, 7 The Croft, Bishopstone, Salisbury, Wiltshire SP5 4DF (01722 780435). The Cornish Wurzells and The Cadgwith Singers at 1st St Piran's Festival at Cornwall Pirates Rugby Club, Camborne Recreation Ground, Camborne, Cornwall TR14 7PW (04736 331061) The first ever St Piran's Festival with the Cornish Pirates match against Bedford Blues set against a celebration of all that is good about Cornwall including fairground rides, Cornish food and drink, and activities for all the family, including a funfair and bouncy castle. There is also a Kicking Competition backed by St Austell Brewery, a helicopter display by RNAS Culdrose, music and dancing from Cornish Acts and the Camborne Youth Band, and a Giant Pasty Parade led by the Falmouth Marine Band. 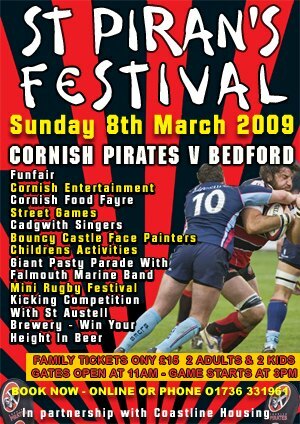 Gates open at 11am, the Pirates vs Bedford match kicks off 3pm; and the The Cornish Wurzells will be performing after the match. Family Tickets from just £15.00. Who's Afear'd and The Boot Hill All Stars (8pm) at No. 6 Pub, King Street, Weymouth, Dorset. Entry £2.00 on the door. The Mangledwurzels, The Glambusters and Out Of The Ashes (8pm) at Siston and Warmley Green Spaces Fundraiser at Pucklechurch Village Hall, Abson Road, Pucklechurch, Bristol BS16 9RH. A great evening of fun whilst raising much-needed funds for this worthwhile cause. Raffle, information stall, snacks and late bar until 11.45pm. Tickets £10.00 each; sure to sell fast, so please book early! Contact Chris Pedlar, 30 Kingsleigh Park, Kingswood, Bristol BS15 9PL, enclosing an SAE with your order. Cheques/postal orders made payable to "Save Siston and Warmley Green Spaces Group". Tickets also available at the group's weekly Tuesday meetings at the Midland Spinner pub in Warmley (7.30pm). Who's Afear'd (4pm-6pm) at Cider Sunday at The Royal Portland Arms, 40 Fortuneswell, Portland, Dorset. Over 20 ciders and ploughmans grub on offer. The Yetties (8pm) at Elmsthorpe Village Hall, Elmsthorpe, Leicestershire. For tickets and more information contact Roy Sutton, 10 Station Road, Elmsthorpe, Leicestershire LE9 7SG (01455 846203). The Mangledwurzels (9pm) at Scrumpy & Western Cabaret Night at The Olde Forge Inn, Church Street, Curry Rivel, Langport, Somerset TA10 0HE (01458 251 554) Tickets £10:00 including luxury buffet and dessert available from the pub; info@oldeforgeinn.co.uk. The Yetties at Fundraiser for The Welmar Hospice at Chideock Village Hall, Chideock. For tickets and more information contact Guy Mills on 01297 489231. Splendid food followed by concert. The event sold out very quickly last year so don't wait to long! Bonny Sartin (The Yetties) (7pm) at The Town Hall, East Street, Bridport, Dorset. Bobby is giving a talk entitles "Dorset Is Beautiful...BUT" about the plight of Dorset farm labourers between in 1750-1875 illustrated with songs and poems. Tickets from the Bridport Local History Centre (01308 458703) or Bridport Music (01308 425797). The Yetties (7.30pm) at West Chinnock Village Hall, West Chinnock, Somerset. For tickets and more information contact Mrs. Brenda Cochran, 5 Hillview Close, West Chinnock, Somerset TA18 7QH (01935 881585). The Cutlers of Cornwall at Exmouth Pavilions, Exmouth, Devon Event cancelled! The Wurzels and 92vine at Thornbury Leisure Centre, Alveston Hill, Thornbury, South Gloucestershire BS35 3JB (01454 865777) Tickets £17.50 in advance; the final few remaining tickets will be sold on the door. The Yetties (7.30pm) at Upton Community Centre, Upton, Poole, Dorset. For tickets and more information contact Mrs. C. Hanniford, 13 Gurjun Close, Upton, Poole, Dorset, BH16 5QH (01202 624549). The Wurzels at The Point, Cardiff. This gig has been cancelled following the venue going into voluntary liquidation. See venue website for more details. The Yetties (7.30pm) at The Corn Exchange, Blandford Forum, Dorset DT11. Contact Mrs. J. Driscoll, 35 Philip Road, Blandford, Dorset, DT11 7NT (01258 458061). Note: this concert was moved from March date because of snow. The Yetties (7.30pm) at Appleton Village Hall, Appleton, Oxfordshire. For tickets and more information contact Angela Arnold, 84 The Phelps, Kidlington, Oxfordshire OX5 1SU. Tel. 01865 378758. The Wurzels, Oompah Band plus Resident DJ (7.30pm) at The Bierkeller, All Saints Street, Bristol BS1 2NA (0117 926 8514) Tickets £13.00. OVer 18s gig only. The Mangledwurzels (8.30pm) at Kings Head Cider Festival at The Kings Head, High Street, Kings Stanley, Stonehouse, Gloucestershire GL10 3JD (01453 825920) Free entry. Three day cider festival at the Kings Head pub with over 40 ciders on offer including 22 guest ciders and 15 bottled ciders. Live entertainment all weekend Carabadeoke (Friday), The Mangledwurzels (Saturday) and Way Out West (Sunday). Fred Wedlock at Village Pump Folk Club at The Lamb, Trowbridge. Tickets £5.00 on the door. Contact John Alderslade on 01225 707346 for more information. The Yetties (7.30pm) at Musical Heritage of Thomas Hardy Concert in Bradwell Grove Village Hall, Bradwell Grove, Burford, Oxforshire. For tickets and more information contact Valerie Kent, 9 Acer Close, Bradwell Grove, Burford, Oxforshire OX18 4XE. Tel. 01993 823294.
Who's Afear'd (8.30pm) at The Seven Stars, Thomas Lane, Bristol BS1. Donations to raise funds for a commemoration plaque for Abolitionist Thomas Clarkson; see the Bristol Radical History website for more details. The Variety Club Childrens Charity South West presents A Tribute to Acker Bilk: his Music and the Man at Thistle Hotel, Broad Street, Bristol BS21 2EL. Dinner (7.30pm) including raffle, an auction of one of Acker's original paintings and some surprises! For tickets and more information call 0117 967 5281. The Yetties at The Farnham Beerex at The Maltings, Farnham. This is run by the local Lions Club and if you are into real ales and cider you shouldn't miss it. The Plonkers Agricultural Orchestraat St Georges Day Bash at The Wheatsheaf, Braishfield Road, Braishfield, Romsey, Hampshire, SO51 0QE. The Wheatsheaf is a friendly, traditional village pub, well, until The Plonkers arrive! The Wurzels at Cricket St Thomas, Chard, Somerset TA20 4DD (0800 138 26 32) Adults-only weekend break at this premier hotel chain. The Yetties (7.30pm) Fundraiser for Grace Secondary School in Sudan at Corn Exchange, Dorchester, Dorset. This is a great project and brick making and building has already begun. I can remember seeing all the brick making kilns on the banks of the Nile when we were in Sudan in 1984. For tickets and more information contact Clair or Richard Budd on 07764 335892 and 07767 895205 respectively. Who's Afear'd (7pm) at Endorse It In Dorset Festival Promotion Night at The White Hart, Wimborne, Dorset. The Wurzels, The Popes, The Whiskey River Boys and the Chris Quinn Band at Clun Green Man Festival at Clun Memorial Hall, Clun, Shropshire SY7 8NY The Wurzels will be headlining on the Sunday (3rd) evening; tickets for that show are £15.00 through Skiddle.com; tel: 0844 884 2920. The Vale Of Aylesbury Hunt Supporters Club present The Wurzels (7.30pm) at Standalls Farm, Bishopstone, near Aylesbury, Buckinghamshire HP17 8SL. Advanced tickets £25.00; £20.00 for hunt members (max 4 per member). Entry only by ticket. Contact Ian (07850 305565) or Nyree (07795 630207) for tickets and more details. Licensed bar and food available. The Mangledwurzels at Melksham Labour Club, 3 Lowbourne Road, Melksham, Wiltshire SN12 7DZ (01225 702408) Tickets are £6.00 each, available from direct the club. The Mangledwurzels (noon-late) at Scrumpy and Western Day at The Rising Sun, 61 Woodmarsh, North Bradley, Trowbridge, Wiltshire BA14 0SB (01225 752453) Ticket price includes all day free cider bar in the beer garden with ten scrumpy ciders and organic wines plus cheese and biscuits; and roast dinner, live entertainment and discounted drinks in the pub. Magic Show and Punch & Judy Show for the children (starts 3pm) with The Mangledwurzels playing in the evening (from 8.30pm). Tickets £8.50 per person; children free. Limited numbers; get your tickets now before they sell out! Who's Afear'd at 2nd Annual Dorset Knob Throwing Festival at Cattistock Village Green, Cattistock, Dorset. Music, food festival and biscuit-themed country games. Free entry. The Mangledwurzels, Dave Griffiths and Freak Circus (10am) at 5th Blandford Beer Festival at The Railway Hotel, Oakfield Street, Blandford Forum, Dorset DT11 7EX (01258 456374) Free entry. The festivals runs from Friday to Monday with 54 different ales all brewed in Dorset, Cornwall, Devon, Somerset, Guernsey or Jersey. The Cider section will be slightly larger with products from the Channel Islands and Dorset. There will be a new local wines section featuring the output from vineyards in Dorset and the Channel Islands. The Mangledwurzels will be on stage at noon on the Bank Holiday Monday! Twurzel (6pm) at Wadebridge Cricket Club, Egloshayle Road, Wadebridge, Cornwall PL27 6AE. Fundraiser for the Precious Lives Appeal. MEMM Promotions present The Mangledwurzels plus Ode & The Be-Bops (8pm) at Riff's Bar, 26 Greatfield, Swindon, Wiltshire SN4 8EQ (01793 778 304) Tickets £4.00. All ages gig; under 16s must be accompanied by an adult; under 14s get in free. The Plonkers Agricultural Orchestra (9.30am-4.30pm) at Sparsholt College Countryside Day at Sparsholt College, Winchester SO21 2NF The famous Sparsholt College is open to the public, plus in their village fete area The Plonkers are playing live from 11am-3pm. Free parking. The Yetties and Fred Wedlock (7.30pm) at Leaze Farm, Bulkington, Wiltshire. For more details contact Mrs. Susan Noad, 33 Littleton Willows, Semington, Trowbridge, Wiltshire BA14 6LQ (01380 870343). The Plonkers Agricultural Orchestra at The Selwood Steam & Vintage Vehicle Rally, Southwick, Trowbridge, Wiltshire. The rally takes place over the late May bank holiday 23rd-25th May; The Plonkers are playing live on Saturday between 8pm-11pm. The Wurzels at The Imperial, New North Road, Exeter, Devon EX4 4AH (01392 434050) Free entry! The New Forest Plonkers at Country & Western Barbecue at South Lawn Hotel, Lymington Road, Milford-on-Sea, Lymington, Hampshire SO41 0RF (01590 643911) Check website for more details. The Wurzels (noon-5pm) at Box Revels at The Recreation Ground, Box, Somerset. Tickets on sale from Box Post Office. Money raised goes to village good causes. The New Forest Plonkers at Sherborne Castle Country Fair, Sherborne Castle Fairground, Sherborne Castle, Sherborne (08700 115622) Check website for ticketing details. The Wurzels at Royal Bath & West Show at The Showground, Shepton Mallet, Somerset BA4 6QN (01749 822222). Advanced tickets now on sale £17.00 adults; £15.00 concessions. The Wurzels make their annual visit to the Royal Bath & West Show - daytime performance; times and location to be confirmed (see the Show Programme on the day). The Cornish Wurzells, Truro Male Voice Choir and Camborne Town Band (7.30pm) at Hall for Cornwall, Back Quay, Truro, Cornwall TR1 2LL (01872 262466) Tickets £13.00 and £10.00 plus booking fee. The Boot Hill All Stars and The Lucky 7’s (8pm) at The Lock Up at The Wheatsheaf, 23 Bath Street, Frome Somerset BA11 1DJ Free entry. Endorse It In Dorset Festival warm-up gig with CD giveaways and the opportunity to buy festival tickets free of the 4.5% booking fee. The Wurzels, Bad Manners, Angie Brown, Anita Doth (2-Unlimited), Limahl, Bucks Fizz, Scott Mills, D:Ream plus others at Skool Reunion at Butlins, Minehead, Somerset TA24 5SH (0870 242 0870) Tickets from £80.00 per person for three days (was £94.00!). Have the best days of your life - all over again! Butlins is hosting the biggest Skool Reunion party to put you back in the mood – everything from the smash hits to the slow smoochers. With original bands, great tribute acts and DJs across two stages for three nights, Skool Reunion is absolutely skill! The Wurzels headline on the Saturday evening. The Yetties (7.30pm) at Teign Valley Community Hall, Cristow. Contact Mr. R. Wharton, Pengarth, Wet Lane, Cristow, Exeter, Devon, EX6 7NQ. Tel. 01647 252147. Fred Wedlock at Chippenham Town Hall, Chippenham, Wiltshire. Supper and concert; contact Bryon Hughes on 01249 652075 for more details. The Yetties (8pm) at Yetties Music Night at The Weavers Sports & Social Club, Westbury, Sherborne, Dorset DT9 3EL. Tickets £6.00 from Pete Shutler, Maybank, Marston Road, Sherborne, Dorset DT9 4BJ; tel. 01935 814667. Cheques made payable to 'The Yetties' please. The Wurzels (9.15pm) at Annual Cider Festival at Bath Racecourse, Lansdown, Bath, Somerset BA1 9BU (01225 424609 ) Tickets £18.00 (paddock & grandstand), £22.00 (Premier), £10.00 (centre course enclosure); 20% group discount. First race: 6.05pm; last race: 9.05pm. Local ciders available to buy. The Wurzels playing after the last race. On the last two years this event sold out, so book early to avoid disappointment. The Wurzels and The Communicators at The Ace Face Festival at Acacia Farm, Bristol Road, Rooksbridge, Axbridge, Somerset BS26 2TA (01934 750314). Advanced tickets £17.00 on sale now; free camping and caravan permits with tickets. The Yetties (7.30pm) at Harriett Costello College, Basingstoke, Hampshire. Contact Maurice Hockley, 27 Neville Close, Basingstoke, Hampshire RG21 3HG (01256 421867). Chris Jagger Band, Who's Afear'd and Steve One Bloke One Mandolin (7pm) at The Princess Hall, Princess Street, Burnham-on-Sea, Somerset TA8 1EH (01278 783161) Tickets are £5 in advance, £8 on the door. Tickets are available from GC Music, The Old Pier Tavern, or credit card sales on 01278 783161. Parking is available Burnham’s Oxford Street car park and Burnham’s swimming pool car park. The Mangledwurzels (3pm) at Open Farm Day at Mill Farm, Quab Lane, Wedmore, Somerset BS28 4AR (0117 942 7862) Free entry. Collection and charity raffle in aid of the Farm Crisis Network. The Wurzels, Angie Brown, Toby Anstis, 911, Livin' Joy, Mercury, S Club Party, Wiggy, Cream Anthems Club Night, Miss Moneypenny's Club Night plus others at Hot Summer Party at Butlins, Minehead, Somerset TA24 5SH (0870 242 0870) Tickets from £85.00 per person for three days (was £94.00!). Butlins is hosting the biggest Hot Summer Party to put you back in the mood – everything from the smash hits to the slow smoochers. With original bands, great tribute acts and DJs across two stages for three nights. The Wurzels headline on the Saturday evening. The Yetties (7.30pm) at Durley Village Hall, Dorley, Southampton, Hampshire SO32. Contact Mrs. Anne Collins, Homefield, Kytes Lane, Durley, Southampton, Hampshire SO32 2AE. Tel. 01489 860236. Fred Wedlock plus The Red Smed Band at Tacchi-Morris Arts Centre, School Road, Monkton Heathfield, Taunton, Somerset TA2 8PD (01823 414141) Tickets £8.50 and £7.50. The Wurzels and Stompin' Dave at The World Stinging Nettle Eating Championships at The Bottle Inn, Marshwood, Dorset (01297 678254). Advanced tickets on sale now. The Mangledwurzels (noon) at Wimborne Folk Festival at The Bell Hotel, 71 High Street, Wimborne, Dorset BH21 1HS (01202 883105) The Mangledwurzels are due to play between noon & 2pm; timings provisional. The Wurzels at Leaze Farm, North Street, Haselbury Plucknett, Crewkerne, Somerset TA18 7PL (01460 78926). Advanced tickets on sale now. The Plonkers Agricultural Orchestraat The Bournemouth & Poole Preservation Club Steam & Vehicle Rally at Canford Park Arena, Magna Road, Poole, Dorset BH21 3AP. The Plonkers are playing daytime shows on both days. Fred Wedlock at Aston Village Hall, Aston, Oxfordshire. Contact Sylvia on 01993 850553 for ticketing availabiity and further details. The Mangledwurzels at Kemble Air Show at Kemble Airfield, Cirencester, Gloucestershire GL7 6BA Tickets £18:50 in advance, £25.00 on the day. The Mangledwurzels are due to performing in the beer tent at 12.30pm and & 6pm. Surfin' Turnips and Perverts (8pm) at Venue tbc, Salisbury. Details to follow. The Plonkers Agricultural Orchestra(9pm) at Salisbury Racecourse, Salisbury. Details to follow. Who's Afear'd (3pm) at Harry Paye Day on The Fish Shambles, Poole Quay, Poole, Dorset BH15 1BP. Open air gig on Poole Quay - a day full of fun activities, floats, paddling races, live music, fancy dress and much more celebrating Poole's most notorious pirate. Bill Bailey at Olympia Theatre, Dublin, Ireland. Tickets E23.00 including booking fee; on sale now. The Wurzels (7pm) at Chicago Rock Cafe, 74 Middle Street, Yeovil, Somerset BA20 1LU (01935 424500) Advanced tickets on sale now only £7.00! Dress code: 'dress like a Wurzel' or smart/casual, no sportswear. The Yetties (8pm) at Hopton Village Hall, Hopton, Diss, Norfolk. Contact Mrs. M. Capon, Robsons Farm, Hopton, Diss, Norfolk IP22 2QZ (01953 681258). Fred Wedlock at 40s Dance at Conygre Hall, Timsbury, Bath, Somerset. Detail to be confirmed. The Mangledwurzels (1-4pm) at Bath Charity 7s Rugby Tournament at University of Bath, Claverton Down, Bath BA2 7AY. A national rugby 7s event sponsored by Land Rover raising money for Help For Heroes charity. There are four competitions catering for all standards with a £7,000 prize fund on offer; entries now being accepted. Contact John Gould on info@bathcharity7s.co.uk for more details. The Mangledwurzels will be playing in the Trade Village Marquee in the early afternoon. The Plonkers Agricultural Orchestra at Christchurch Hospital Open Day at Christchurch Hospital, Christchurch. Details to follow. Who's Afear'd (4pm) on The Bandstand at Glastonbury Festival at Worthy Farm, Pilton, Somerset. Festival sold out! Surfin' Turnips, The Dreadnoughts, 'Acksaw and AST (9pm) at The Reckless Engineer, Temple Meads, Bristol. £3.00 on the door. Old skool punk night with a Scrumpy & Western twist... Canadian band The Dreadnoughts are playing as part of their European tour, and the Bristol date of the tour will be their debut UK show. The Wurzels, Rogue Minogue and Bluestone (6.45pm) at Oldbury-on-Severn Village Cricket Club, The Playing Fields, Westmarsh Lane, Oldbury-on-Severn, South Gloucestershire BS35 1QD. Advanced tickets on sale now; email tickets@oosvcc.co.uk. Tickets cost £12.50 for adult, £7.50 for U14/OAP, Family tickets (2A, 2C) £30. BBQ & Bar. Plenty of cover under marquees. The Yetties (7pm) onboard the Bluebell Railway. Full steam ahead for the Bluebell Line. Concert as usual at Horsted Keynes Station. Tickets from The Bluebell Railway at 01825 720800. The Wurzels, Daz, Chuff and Woodchuff (noon) at Super Cider Sunday at Bar BS3, 21 Ashton Road, Ashton, Bristol BS3 2EA (0117 966 4900) Doors open at noon; entertainment starts at 2pm. Tickets £15.00 on sale now; limited availability so book early! The Yetties (8pm) at Yetties Music Night at The Weavers Sports & Social Club, Westbury, Sherborne, Dorset DT9 3EL. Tickets £6.00 from Pete Shutler, Maybank, Marston Road, Sherborne, Dorset DT9 4BJ; tel. 01935 814667. Cheques made payable to 'The Yetties' please. No charge for performers! 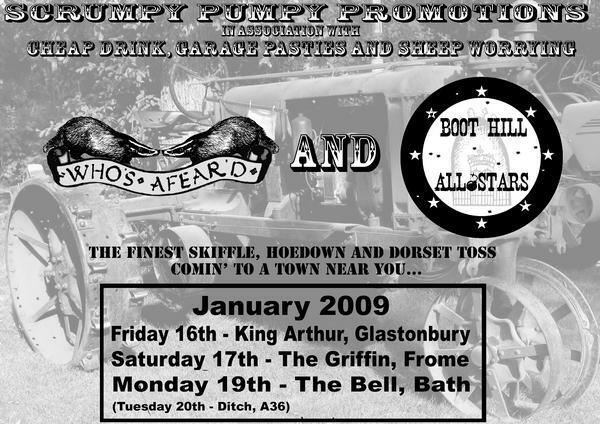 Who's Afear'd and Boot Hill All Stars (8pm) at Frome Festival 2009 at The Griffin, Milk Street, Frome, Somerset. Free entry (donations appreciated). The Yetties at Yetminster Fair Day at Yetminster, Dorset. A great day for all the family. For concert tickets contact Ron & June Page, 3 Bucklers Mead, Yetminster, Sherborne, Dorset, DT9 6LA (01935 872940); for other information, camping, hiring stalls through the day etc. contact Garth Hentley on 01935 873239. Call Sherborne Tourist Information on 01935 815341 for accomodation options. The Mangledwurzels (9pm) at Music on a Summers Evening at Moorland Farm, Hectors Lane, Lyng, Taunton, Somerset TA3. Please note: the venue has been changed as the Village Hall is too small. Part of the Annual Lyng Village Day. All day event with competitions, games and stalls, and cream teas avauilable in the afternoon. The Mangledwurzels will be playing at 8pm. Evening tickets £5.00 in advance; £7.00 on the door; children (5-16) £1.00 all tickets. Advance tickets from Lynn Miller, Stantons Cottage, East Lyng; tel: 01823 698961; all advanced tickets must be bought and paid for by Friday 10th July. Please bring your own refreshments. The Cutlers of Cornwall (11am) at The Wedding of Boris and Dazy at Dairyland Farm World, Newquay, Cornwall TR8 5AA (Infoline: 01872 510349; General Enquiries: 01872 510246) This is the "Wedding of the Year" and everyone is invited! See you all there. The Mangledwurzels (10am-4pm) at Castle Cary Cavalcade of Motoring at Donald Pither Memorial Field, Castle Cary Cricket Field, Castle Cary, Somerset BA7 7HG. £1.00 entry. Show starts at 10am; The Mangledwurzels will be playing two sets at 12.30 and 2.15pm. Somerset Paddies (noon-9pm) at 5th Annual Beer and Cider Festival at Nailsea and Backwell RFC, West End Park, Nailsea BS48 2BP (01275 810818) Three day beer and cider festival. Friday night: no music. Saturday afternoon: Village Fete accompanied by acrobatics, dance and a handful of local performers. Saturday evening: live bands till 10pm. Sunday afternoon: country and folk bands as listed; The Somerset Paddies are playing at 4pm. Advance tickets £6.00 entitling entry for all sessions over the three days, and includes commemorative glass, programme, tasting notes and your first drink. Tickets on the day will cost £7.50, and include your commemorative glass, programme, tasting notes and your first drink. The Cornish Wurzells at The Stithians Show, Stithians, Cornwall. Daytime show. Fred Wedlock with Allie Nourse (fiddle) (8pm) at Somerton Summer Arts Festival at The White Hart, Somerset, Somerset (01458 274148) Tickets £8.00 from Ticket Office c/o London Cigarette Card Co Shop, West Street, Somerton, Somerset TA11 7PR. The Wurzels and MidWest Radio Disco featuring DJ Steve Carpenter at Music In The Park 2009 at Chard Rugby Club, Chard, Somerset TA20 1HR (01460 242400) Tickets are £12.00; ticket hotline for credit card sales is managed by Lift West Ltd on 01460 242400. Tickets can also be purchased from local outlets - stores in Chard and Crewkerne - look out for the Wurzel posters. The Mangledwurzels at 1st Cardiff Cider Festival. Event cancelled by the promoter! The Plonkers Agricultural Orchestra (7.30pm) at The Rally In The Valley Opening Concert at Severn Park, Bridgnorth, Shrophire. The Yetties at Maiden Newton Village Hall, Maiden Newton, near Dorchester, Dorset DT2 Contact Mr. & Mrs. Holloway, 69 Dorchester Road, Maiden Newton, Dorchester, Dorset, DT2 0BG. The Plonkers Agricultural Orchestra (10am-5pm) at The Rally In The Valley at Severn Park, Bridgnorth, Shrophire. A celebration of the coming of the railways. Celebrating the bicentenary of Catch Me Who Can - built at Hazledine's Foundry in Bridgnorth, Shropshire. The Mangledwurzels at Beer Festival at The Waterfront Bar & Bistro, Pewsey Wharf, Marlborough Road, Pewsey, Wiltshire SN9 5NU (01672 564020) £3.00 entrance fee. The Mangledwurzels are due to perform at 1.30pm. The Plonkers Agricultural Orchestra at The Cider House at Quatt, Wootton, Bridgnorth, Shrophire (01746 780285) Evening gig. Acker Bilk & The New Paramount Jazz Band with Kenny Ball & His Jazzmen and Chris Barber Band (7pm) at indigO2 at The O2, Penisula Square, Greenwich, London SE10 0AX (0844 844 0002) Tickets £35.00 - £10.00. The Plonkers Agricultural Orchestra (9.30am-7pm) at Welland Steam and Country Rally, Woodside Farm, Welland, Upton-upon-Severn, Worcestershire. Organised by Ross-on-Wye Steam Engine Society. Phone 01531 890417 or 890762 for more details. Check the event website to discover when and where The Plonkers are playing! The Mangledwurzels (7.30pm) at Bath Cricket Club Cider Festival at Bath Cricket Club, North Parade, Bridge Road, Bath BA2 4EX. Part of the Bath Cricket Club 150th Anniversary Celebrations. Tickets on sale now from the Bath Pavilion Box Office tel: 01225 330304; £6.00 in advance; £7.00 on the door. Over 90 ciders and perries including award-winning ciders from Ben Crossman's, Rich's, Thatchers, Broadoak and Heck's (Somerset), Gwatkin (Herefordshire), Gwynt Y Ddraig (Wales), and Mr. Whiteheads (Hampshire) - as well as hog roast rolls and cheese platters, and a range of soft drinks for the drivers. The Wurzels at Plymouth CAMRA Beer Festival at Plymouth Pavilions, Millbay Road, Plymouth PL1 3LF (0845 1461460) Ticket prices and availability to be confirmed. The Mangledwurzels (noon) at Family Fun Day at Immacolata House Care Home, Portway, Langport TA10 0NQ Charity event raising money for the Alzheimers Society and Freewheelers. The Mangledwurzels are due to perform at noon. The Mangledwurzels plus Harry and The Heckers (9pm) at The Perfect 5th, 61 High Street, Taunton, Somerset TA1 3PT (01823 275 900) Tickets £5.00 in advance; on sale now! Who's Afear'd (8pm) at The Ropemakers, Bridport, Dorset Free entry. The Wurzels at The Nite Owl, Home Farm Holiday Park, Edithmead, Burnham on Sea TA9 4HD (01278 788888) Ticket prices and availability to be confirmed. The Cornish Wurzells (7.30pm) at Magic In The Skies at Lands End Complex, Lands End, Cornwall TR189 7AA. Fun and entertainment from 4pm with street entertainers and live music and the Magic In The Skies firework display at dusk. The Mangledwurzels (9pm) at Bristol Saracens RFC, Bakewell Memorial Ground, Station Road, Cribbs Causeway, Bristol BS10 7TT (0117 950 0037) Club Social/Fundraiser (open gig). Entry by ticket - contact the box office for prices and more details. Somerset Paddies (3pm) at Bristol Harbour Festival outside Jury's Hotel, Harbourside, Bristol. The Somerset Paddies will be playing during the afternoon. The Wurzels at South West Birdman 2009 on The Truck Stop Stage at Ilfracombe Pier, Ilfracombe, Devon. Charity fundraiser run by Ilfracombe Round Table in aid of local causes. Spectacular flying machines (some which might actually fly! ), Strongman competition and live bands on the Truck Stop Stage with fairground attractions, stalls and refreshments. Ticket prices and availability to be announced soon. The Mangledwurzels (2pm) at Cider Festival at The Foresters Arms, Holywell, East Coker, Yeovil, Somerset BA22 9NF (01935 862554) The Foresters' Summer Cider Festival is a three-day event running Friday to Sunday. 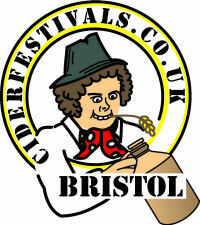 Expect over 20 real ciders from local cidermakers including Bridge Farm, Perry's Burrow Hill and Thatchers. Normal pub opening hours; Free entry. Live entertainment over the weekend, courtesy of ME Promotions. Midlife Crisis are playing on Saturday night, with The Mangledwurzels performing from 2pm on Sunday afternoon, followed by No Closure in the evening. The Yetties (8pm) at Yetties Music Night at The Weavers Sports & Social Club, Westbury, Sherborne, Dorset DT9 3EL. Tickets £6.00 from Pete Shutler, Maybank, Marston Road, Sherborne, Dorset DT9 4BJ; tel. 01935 814667. Cheques made payable to 'The Yetties' please. No charge for performers. Surfin' Turnips, Who's Afear'd and The Boot Hill All Stars plus Dreadzone, Sham 69, Pronghorn, Zion Train, Pama International, SubGiant, Back to the Planet and Eat Static at Endorse It In Dorset 09 Festival at Oakley Farm, Sixpenny Handley, Dorset SP5 Tickets on sale now at £68.00 plus booking fee. The Endorse It In Dorset 09 Festival is renowned for its friendly, laidback appeal, harking back to the days before festivals were corporate-driven events on the social calendar. Surfin' Turnips plus many others at Boomtown Fair (formerly Rehydrate The West), somewere near Bristol. Tickets on sale now from Bristol Ticket Shop: Eager Beaver tickets £45 (while stocks last! ); otherwise £58 with under 12s getting in free (with paying adult). Car pass £10, camper vans £30; Boom Bus return from central Bristol £12. Gates open noon on the Friday. The Mangledwurzels (7.30pm) at 2nd Bristol Cider Festival at the Brunel Passenger Shed, British Empire & Commonwealth Museum, Station Approach, Temple Meads, Bristol BS1 6QH Tickets on sale now from the Bath Pavilion Box Office tel: 01225 330304; £6.00 in advance; £7.00 on the door. Over 90 ciders and perries including award-winning ciders from Ben Crossman's, Rich's, Thatchers, Broadoak and Heck's (Somerset), Gwatkin (Herefordshire), Gwynt Y Ddraig (Wales), and Mr. Whiteheads (Hampshire) - as well as hog roast rolls and cheese platters, and a range of soft drinks for the drivers. The Mangledwurzels (11.30am) at 2nd Bristol Cider Festival at the Brunel Passenger Shed, British Empire & Commonwealth Museum, Station Approach, Temple Meads, Bristol BS1 6QH Tickets on sale now from the Bath Pavilion Box Office tel: 01225 330304; £6.00 in advance; £7.00 on the door. Over 90 ciders and perries including award-winning ciders from Ben Crossman's, Rich's, Thatchers, Broadoak and Heck's (Somerset), Gwatkin (Herefordshire), Gwynt Y Ddraig (Wales), and Mr. Whiteheads (Hampshire) - as well as hog roast rolls and cheese platters, and a range of soft drinks for the drivers. The Wurzels and The Bucket Boys at West Country Cyder & Hog Roast Evening at Events Square, Falmouth (0844 2092025) Part of Henri Lloyd Falmouth Week with Atlantic FM. The Wurzels, T-Rextasy and Dr and The Medics at 2009 Isle of Wight Garlic Festival at Newchurch, Isle Of Wight (05602 786785/01983 614612) Tickets: adults £7.50; senior £6.50 children £4.00; Tickets available at the gate on the day. The Mangledwurzels (8am-6pm) at The Mid-Somerset Show at Shepton Mallet Showground, Cannard's Grave Road, Shepton Mallet, Somerset BA4 4LY Free entry; parking £7.00. Gates open at 8am; The Mangledwurzels will be playing two sets during the day on the Upper Showfield at 1.15pm and 4pm. The Wurzels' Big Summer Party at Godney Farm, Godney Road, Godney, Glastonbury, Somerset BA5 1RX. Organised by the Masqueraders Carnival Club. Ticket details to follow - check website for details. The Plonkers Agricultural Orchestra at Purbeck Vintage Rally & Auto Jumble, Worgret Road, Warehan, Dorset. The Plonkers will be playing on and off all day on the Saturday. The Plonkers Agricultural Orchestra at 36th Yesterday's Farming Show "A Gateway Back to the Past" at Dillinton Country Park, near Yeovil, Somerset. A two-day festival opening 9am each day; The Plonkers will be playing on the Sunday lunchtime. Organised by The South Somerset Agricultural Preservation Club with heavy horses, traditional hay-making, field gun dog display, over 200 working classic and vintage tractors, horticultural ploughing machinery, arts and crafts, dairy bygones, stationary engines and live stea, commercial vehicles, live stock rare breeds, and a Village Green. Licensed Bar Food available by the Gremlins Carnival Club (Winners of Bridgwater Carnival 2006). All the fun at a Great Country Show! The Wurzels, The Men They Couldn't Hang, 3 Daft Monkeys, Dynamo Rhythm Aces, Rogue Minogue, The Reoffenders plus others at Watchet Carnival Music Festival, The Down on Parsonage Farm, Watchet, Somerset. Details to follow. Fred Wedlock, Tannahill Weavers, Jez Lowe and many other at Wadebridge Folk Festival, Wadebridge, Cornwall. Fred is playing on the Friday evening on the main stage (7.30-10pm); tickets £13.00 (£7.50). All-day and weekend tickets are also available (see website for details). Bonny Sartin (of The Yetties) at Nether Stowey Arts Evening at Nether Stowey Village Hall, Nether Stowey, Somerset. The Friends of Coleridge present "Halsway Manor" by Bonny Sartin; Bony is president of the Halsway Society and tells the story of the National Centre for Traditional Music and Song and illustrates his talk with song. Admission £2.50 which includes wine or juice. The Mangledwurzels, Ten Pound Suit Band plus DJ (8pm) at 152nd East Brent Harvest Home, Jarvis Lane, East Brent, Highbridge, Somerset TA9 4HS (01278 760695) Church service, luncheon, auction of surplus goods, raffle, slave auction, afternoon tea and evening entertainment. Church service at 11am. Luncheon at 12.45pm (advanced tickets £16.00); afternoon tea at 4.15pm (small charge). Evening entertainment at 8pm with The Mangledwurzels (tickets £9.00). The New Forest Plonkers (9am-6pm) at Rudgwick Steam Show, Windacres Barn, Rudgwick, West Sussex RG12 3EG (01403 822378) The New Forest Plonkers are playing live sets in the Beer Marquee on all three days! The Mangledwurzels at Bratton Cider Festival Day at The Duke at Bratton, Melborne Street, Bratton, Westbury, Wiltshire BA13 4RW (01380 830 242) Free entry. Normal pub opening hours; The Mangledwurzels are due to perform at 2pm. Fred Wedlock at Scragford Folk Club, Oakthorpe, Derbyshire. Contact Dave Johns on 01530 270494 for more details. The Mangledwurzels (noon) at The Cowfields, The Manor House, Ashington, Somerset BA22 8ED Bi-annual charity fundraiser with live music and barbecue running all weekend. The main event is on the Saturday; The Mangledwurzels are providing the entertainment on their Sunday lunch session from noon. Come and chill out and enjoy a bar, BBQ and an entertaining “Lawn Mower Racing Competition” which anyone can enter if they dare! Weekend Tickets: adult £25.00; under 18’s £10.00; under 12’s free. Sunday only tickets: £10.00 per adult; under 18’s £5.00. Free onsite camping. Barry 'Plonker' Hinchley, Keith 'Scarecrow' Harris from The Carrot Crunchers (2pm) at Stogursey It's a Knockout at Stogursey Playing Fields, Stogursey, Somerset TA5 1PR. Event will be opened by Peter Rowell from ITV West at 2pm, and includes a fun It's a Knockout course, Traditional Fete, Licensed bar, BBQ, car boot and lots more. Free entry and parking. Live music in the evening by two of the original Carrot Crunchers with other band members attending. For more info contact Allen Loveday at stogknockout@googlemail.com. The Wurzels, The Plonkers Agricultural Orchestra and The New Forest Plonkers and various other bands at Great Dorset Steam Fair, Blandford Forum, Dorset DT11 8HX. The Great Dorset Steam Fair Music Festival has live bands across five days on five stages. Tickets cost £5.00 for the Concert Stage; all other stages are free. The Wurzels are on the Concert Stage on Thursday 3rd. The Plonkers Agricultural Orchestra are on the Concert Stage (12.30 and 3.30) on Friday 4th, and also playing at Brian Jervis's Scrumpy Jack Cider Bar on Saturday night (5th). The New Forest Plonkers are on the Country Marquee at lunchtime, and by the New Forest Cider Tent (8pm-midnight) on the Saturday (5th). The Wurzels (8pm) at Exmouth Pavilion, Esplanade, Exmouth, Devon EX8 2AZ (01395 222477) Ticket prices to be confirmed. The Yetties at Barn Dance at venue tbc, Thornford, Sherbourne, Dorset. Fundrasier for the Sherborne Town Band. For more details give Pete Shutler a ring on 01935 814667. The Mangledwurzels at 3rd Annual Beer Festival at The Inn at Freshford, Freshford, Bath, Somerset BA2 7WG (01225 722250) Entrance £4.00 including a commemorative glass and your first half-pint of beer or cider. The beer festival runs over the Friday and Saturday with live music on both nights, 20 real ales from 'Oop North' as well as the full range of Box Steam Brewery ales, and 10 award-winning ciders and perries. The event will also be raising funds for Dorothy House Hospice Care. Friday night sessions runs from 6pm to 11pm, and features The Mangledwurzels who are due to perform at 9pm. The Saturday sessions runs from 11am to 11pm, and features The Bedwyn Busker and The Jon Walsh Blues Band. The Plonkers Agricultural Orchestra at Swanage Railway Steam Gala And Vintage Transport Rally, Haycrafts Lane, Harmans Cross, Swanage, Dorset BH19 1HB. This event is run by Bournemouth and Poole Preservation Ltd. The Plonkers are playing 12th and 13th September from 1pm-4pm(-ish). The Yetties (7.45pm) at Long Hanborough Village Hall, Long Hanborough, Witney, Oxfordshire OX29. Contact Bob Buckingham, 20 Millwood Vale, Long Hanborough, Witney, Oxfordshire OX29 8DF(01993 882468). The Mangledwurzels (8.30am) at 132nd Frome Cheese Show at The West Woodlands Showground, West Woodlands, Frome, Somerset BA11 5ES (08700 115007) Tickets £8.00 in advance; £12.00 on the day; concessions £6.00 in advance; £10.00 on the day; children under 16 free (with paying adult). The Mangledwurzels will be playing two sets - probably at midday and at end of show (times to be confirmed). The Wurzels at Gordano RFC, Caswell Lane, Portbury, Bristol, North Somerset BS20 7UF (01275 373486) Ticket prices to be confirmed; contact 07702 392123 for more info. The Wurzels at BSB Waterfront, Canons Road, Bristol BS1 5UH (0117 911 4950). Advanced tickets £15.00; book now to avoid disappointment. The Wurzels with Who's Afear'd (8pm) at City Hall, Malthouse Lane, Salisbury, Wiltshire SP2 7TU (01722 434434) Tickets £12.00 plus booking fee. The Mangledwurzels and Lost Monkey (noon) at Beer & Cider Festival at The Kings Head, The Street, Kingscourt, Stroud, Gloucestershire GL5 5DR (01453 872336) Normal pub opening hours; The Mangledwurzels are due to perform at noon; local band Lost Monkey will be playing in the evening. Admission on the gate: Adults: £3.00; kids: £1.00; under 10s: free. 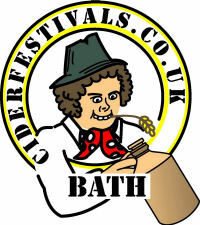 On offer will be 10 beers on all local to Stroud as well as 6 traditional ciders. All beers will be £2.50 pint / £1.25 half; ciders £2.30 pint / £1.15 half. There will also be pork rolls and curry on offer, as well as an all-day barbecue serving burgers, hot dogs, etc. The Mangledwurzels (2pm) at Mermaid Inn, Bristol Road, Sherborne, Dorset DT9 4JD (01935 817065) Free entry. Normal pub opening hours; The Mangledwurzels are due to perform at 2pm. The Wurzels at Bratton Clovelly Village Hall, Bratton Clovelly, Okehampton, Devon EX20 4JY Ticket prices and availability to be confirmed. Who's Afear'd and Boothill All Stars (8pm) at The Ropemakers, Bridport, Dorset. Free entry. The Yetties with The Casterbridge Male Voice Choir (7.30pm) at Bridport Arts Centre, Bridport, Dorset. Tickets from Dorchester or Bridport Tourist Information Centres. The Plonkers Agricultural Orchestra at Steam Pressing Weekend at New Forest Cider, Littlemead, Pound Lane, Burley, Hampshire. Barry Topp has invited back Golly and the gang to play at his steam cider press open day. Demonstrations during this two-day event include a steam driven cider press, hurdle makers, wood turning and it is all going be Plonkerised, as Golly and The Plonkers will be playing live (providing they don't have too much cider). The Mangledwurzels plus Disco (7.30pm) at A Celebration of the Best of the West! at Dyrham Village Hall, Dyrham, South Gloucestershire SN14 8. Advanced tickets only - £7.50; available from Jay (James Beese) on 07841 187212 or Jamie on 07946 556948. A proper West Country Disco, BBQ with West Country meat, licenced bar with selection of West Country ciders. The City Of Bath Lions Club presents Fred Wedlock (7.45pm) at Selwyn Hall, Box, Somerset. Charity fundraiser to raise money for Colerne Playgroup and other projects supported by the Lions. Tickets £12.50 including ploughman's supper, available from Colerne and Box post offices, or directly from The City Of Bath Lions Club on 01225 422818. The Mangledwurzels (7pm) at Harvest Supper at Brent Knoll Parish Hall, Brent Street, Brent Knoll, Highbridge, Somerset TA9 4EH Doors open 7pm, Harvest Supper served at 7.15pm. The Mangledwurzels will be performing from 8pm (after the meal). Advanced tickets only priced £14.00. Tickets available from Brent Knoll Post Office or Eddie Fuller (tel: 01278 760308). Price includes fully locally produced harvest supper, home-made pudding and a glass of local cider or fruit juice. Licenced bar and raffle. The Cornish Wurzells at Indian Queens Working Mens Club, Indian Queens, Cornwall. Tickets available from Wicker’s World Travel, Newquay; Price: £9.00. The Mangledwurzels (5pm-2am) at OxJam Bath Music Festival 2009 at The Green Park Brasserie, Green Park Station, Bath BA1 1JB (01225 338 565) Tickets are available in advance from WeGotTickets at £10.00 giving access to all venues. Charity fundrasing music festival showcasing a selection of live music from rock to jazz, country to reggae, dubstep to folk across eight Bath venues. Exchange your reference number for a wristband on the day of event allowing you access to five bars, three clubs, loads of bands, Oxjam Cocktails, discounted meals and much more. The event runs from 5pm to 2am; The Mangledwurzels will be headlining at The Green Park Brasserie who will be opening their doors at 7.30pm with The Mangledwurzels on stage about 9.30pm. Juz Greg (2pm) at Pucklechurch Community Centre, Abson Road, Pucklechurch, Bristol BS16 9RH. Happy Circle presents a singalong with Juz Greg and the music of Elvis, the Beach Boys, Jim Reeves, The Wurzels, and more. All welcome (£1 per person). Fred Wedlock at Soudley Village Hall, Soudley, Gloucestershire. Contact Libby Bullock on 01594 822289 for more information. The Wurzels and Who's Afear'd (8pm) at The Globe, 125 Albany Road, Roath, Cardiff CF24 3NS (02920 230130) Tickets £12.00 in advance. Fred Wedlock at Quedgeley Village Hall, Quedgeley, Gloucestershire. Contact Jenny Hill on 01452 722099 for more information. The Mangledwurzels at Henbury Social Club, Tormarton Crescent, Henbury, Bristol BS10 7LN. Members & guests only. Bill Bailey with Anne Dudley and the BBC National Orchestra Of Wales in Bill Bailey's Remarkable Guide To The Orchestra at Wales Millennium Centre, Bute Place, Cardiff, South Glamorgan CF10 5AL (08700 40 2000) Tickets £60.00 - £25.00. Fred Wedlock at Walwyn Arms, Much Marcle, Herefordshire. Contact Andy Kirby on 01531 660758 for more information. The Mangledwurzels at Bonfire Night Firework Display at Puxton Park, Cowslip Lane, Hewish, Weston-super-Mare, Somerset BS24 6AH (01934 523 500) Puxton Park's Bigger, Better Firework Display! Gates open at 6pm; fireworks start at 8pm. More parking, more facilities, more food and drink stalls and more fun for all the family! The Mangledwurzels will be performing between 6pm and 8pm. Tickets £4.00 in advance; £5.00 on the night. Under 2s get in for free. The Wurzels plus The Red Hillbillies at Cadbury House Hotel, Frost Hill, Congresbury, North Somerset BS49 5AD (01934 834343) Start the evening with a fantastic firework display at 7pm, bar and guest ciders, BBQ and Hog Roast, and Disco until 1am. Tickets £15.00 per person - Advance purchase only (ticket includes event admission and fireworks, all food and drink will be charged as taken). The Wurzels at Seventies Weekend at Pontins, Brean Sands, Somerset TA24 5SH (01934 733958) Also appearing: The Glitter Band, Heatwave, Les McKeowns Bay City Rollers, T. Rextasy, The Number 1 Seventies Show, Koo Ka Choo, The Heroes, Get Down Tonight, Sing Baby Sing, Kennie Simon and Great Glam Mothers. The Wurzels headline on the Friday evening. The Wurzels and Bristol Bierkeller Oompah Band (7.30pm) at The Bierkeller, All Saints Street, Bristol BS1 2NA (0117 926 8514) Tickets: £14.00 in advance. Fred Wedlock at Laverton Village Hall, Laverton, Gloucestershire. Contact Ann Kelly on 01386 584304 for more information. The Mangledwurzels and Ross Kirk (noon-4pm) at orchard Winter Fair at orchard (formerly The Old Market Shopping Centre), Paul Street, Taunton TA1 3TP (01823 326556) The Mangledwurzels will kick start celebrations at the newly refurbished shopping centre. As well as two live 45-minute sessions from the band, there will be lots of fun and entertainment for all the family scattered throughout the centre including free children's carousel, free children's face painting, free chestnuts and warmed apple juice (while stocks last! ), stilt walkers and entertainers, and hog roast. The Wurzels and The Boot Hill All Stars (7.30pm) at The Subscription Rooms, George Street, Stroud, Gloucestershire GL5 1AE (01453 760900 ) Tickets £12.00. Fred Wedlock at Gambier Perry Hall, Highnam, Gloucestershire. Contact Christine Steadman on 01452 502972 for more information. Surfin' Turnips, Hacksaw, The Lone Shark and The Hormones at Bath City FC Battle of the Bands at Twerton Park, Twerton, Bath BA2 1DB (01225 423087) £5.00 entrance with all funds raised going straight to the club playing budget. The Wurzels at Butlins, Minehead, Somerset TA24 5SH (0870 242 0870) The Wurzels headline on the Sunday evening. Acker Bilk & The New Paramount Jazz Band at The Gap Gig, Goring Village Hall, Goring-On-Thames, Oxfordshire RG8 9LY (01491 875758) Tickets £18.00 in advance. Fred Wedlock appearing in Mrs Gerrish's Christmas Stocking at Nailsea Theatre, Nailsea, Somerset. Details to be confirmed. The Mangledwurzels at The Golden Lion, Worle, Weston-Super-Mare Cancelled by landlord. Rearranged for Saturday 19th December. 'Ere Whacks (8.30pm) at Royal British Legion, 58 Bathford Hill, Bathford, Bath BA1 7SN. Tickets £3.00; cheap bar all night. Fred Wedlock appearing in Mrs Gerrish's Christmas Stocking at Brewery Theatre, North Street, Bristol. All booking enquiries through Tobacco Factory website and booking office; tel: 01179 020344. The Yetties at Christmas Singalong Concert at Orchard Park Garden Centre, Shaftesbury Road, Gillingham, Dorset. For more details contact Sam Woodcock, Hillside, Milton on Stour, Gillingham, Dorset, SP8 5PY (01747 822600); tickets also on sale at Orchard Park Garden Centre. The Mangledwurzels plus Disco (7.30pm) at Charity Fundraiser at Midsomer Norton RFC, Norton Down Playing Fields, Midsomer Norton, Somerset BA3 2UE (01761 412827) Tickets £10.00 from Steve White (07860 235 474) or direct from MSN rugby club. Fundraiser in aid of Macmillan Cancer Trust. Surfin' Turnips supporting K*nt and the Gang at Riff's Bar, 26 Greatfield, Hook, Swindon, Wiltshire SN4 8EQ (01793 778 304) £2.00 in advance or on the door; tickets available from the venue. Over 18s only. The Wurzels (8pm) at Cider Night at The Assembly (Smith & Jones), 110-112 East Street, Bedminster, Bristol BS3 4EY (0117 966 6506) Tickets £20.00 in advance from the pub. On sale now - and selling fast, so this will probably sell-out in advance. Door will be opening from about 7pm. The Mangledwurzels, The Haiku plus support (7pm) at Charity Fundraiser at Melksham Assembly Hall, Market Place, Melksham, Wiltshire SN12 6ES (01225 709887) Raising money for a Wiltshire man to take part in the 2010 Antarctic Ice Marathon, with the eventual goal to raise £30k for the British Red Cross. Tickets are £6.50 in advance; £8.00 on the door. Tickets on sale from The Tavern, Market Place, Melksham SN12 6EX (01225 709932) and direct from The Assembly Halls box office. Bill Bailey with Anne Dudley and the City Of Birmingham Symphony Orchestra (CBSO) in Bill Bailey's Remarkable Guide To The Orchestra (6.30pm) at The O2 Arena, Millennium Way, Greenwich, London SE10 0AX. Tickets will be available from Friday 2nd October, 9:00am priceed at £55.00 - £40.00. MEMM Promotions present The Mangledwurzels plus S-Hit 5 at Riff's Bar, 26 Greatfield, Hook, Swindon, Wiltshire SN4 8EQ (01793 778 304) £4.00 in advance or on the door; tickets available from the venue. Who's Afear'd, The Dolmen and Hallelujah Bay (7pm to 1am) at Dolmen Grove Yule Ball, Portland, Dorset. Tickets £16.00 from Dolmen Grove website. The legendary annual Dolmen "Yule Ball" at a hotel in Portland complete with traditional Yulestyle buffet and mulled wine. Fizzy Milk, Everything We Left Behind, Stillbust and The Shortcuts (7.30pm) at "One For The Road" at Bridgwater Rugby Club, Bridgwater, Somerset. Fizzy Milk's last gig before they fall flat. Entrance £3 before 9pm. Will be a night not to be missed. There'll be tears, fun, awesome music and maybe some bubbly white stuff! The Plonkers Agricultural Orchestra (5.45pm) at Highcliffe-on-Sea Christmas Charity Carnival, Highcliffe-on-Sea. Bill Bailey with Anne Dudley and The Northern Sinfonia in Bill Bailey's Remarkable Guide To The Orchestra (7.30pm) at Sage Gateshead, St Mary's Square, Gateshead Quays, Gateshead NE8 2JR (0191 443 4661) Tickets £55.00 - £50.00. Juz Greg (9pm) at The New Inn, Treloweth Terrace, Park Bottom, Cornwall TR15 3UF. Enjoy a nice meal and some festive entertainment; call 01209 216262 for bookings. The Wurzels plus guest (8pm) at Spiegel Sessions at Speigeltent Majestic, Kings Square, Gloucester, Gloucestershire GL1 1AD. The Spiegel Sessions take place in an amazing 19th century Belgian travelling ballroom, the 'Spiegeltent Majestic'. For one night only, West Country legends The Wurzels will turn this incredible mirrored venue into the world's only 'Ciderkeller', much like a Bierkeller but with even rosier cheeks! Not to be missed. Tickets £13.50. The Yetties with special guest 'The Wag from Widecombe' (8pm) at Christmas Singalong Concert at The Digby Hall, Sherborne, Dorset. Tickets are £7.50 (adults); £6 (children and senior citizens) available from 1st October from 'Rules' (in Cheap Street, Sherborne). Alternatively you can buy them from the Yetties web shop, PO Box 3, Sherborne, Dorset, DT9 3AL or ring 01935 814611/814667/813890. Cheques to 'The Yetties'. Fred Wedlock appearing in Mrs Gerrish's Christmas Stocking at Malmesbury. Details to be confirmed. Who's Afear'd at The Pier Tavern, Burnham on Sea, Somerset. Gig and charity auction with loads of great signed music memorabilia. The Mangledwurzels (9pm) at The Golden Lion, 95 High Street, Worle, Weston-Super-Mare, Somerset BS22 6ET (01934 512569) Free entry. Rearranged from Saturday 28th November. The Wurzels and Who's Afear'd (7.30pm) at Cider n' Cheese Christmas Party at The Tunnels, Arches 31 & 32, Lower Station Approach Road, Bristol BS1 6QF (0117 929 9008) Tickets £20.00. Who's Afear'd (8pm) at The Ropemakers, 36 West Street, Bridport, Dorset DT6 3QP (01308 421255) Free entry. Juz Greg (9pm) at Penzance Royal British Legion, Bread Street, Penzance, Cornwall. Reviving an old custom at Penzance RBL, this will be a great evening of festive singing and laughter. come along for what will be a great night. Fred Wedlock and Three Piece Suite at New Year's Eve Party at Camerton Village Hall, Camerton, Somerset. Tel 01179 048951 for more information. Note: Tickets links are to third party vendors, venues or promotors websites. Although we do try and check that these are reputable companies, these links are for information purposes only. The Scrumpy & Western website (sadly!) has no commercial or other reciprocal arrangements with these companies.